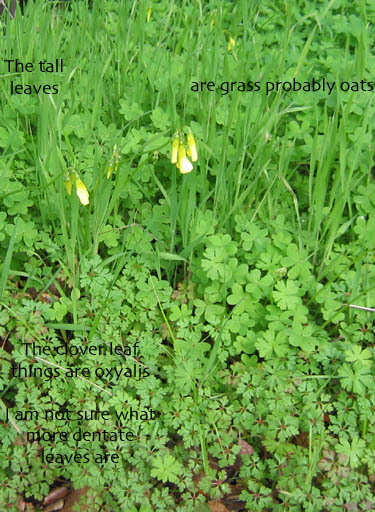 Then there is the "sourgrass" of my childhood, which is a very invasive weed, oxalis coniculata. I misspelled it in the photo. It is everywhere. The long stems are very juicy and have a sour, lemony flavor. We would eat them by the hour when I was a kid, making forts in the mustard. 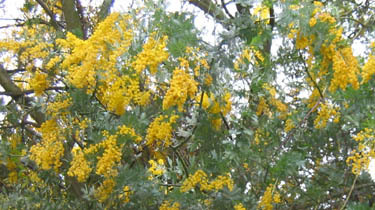 The other thing that is blooming freely is mustard, which seems to have no scientific name. 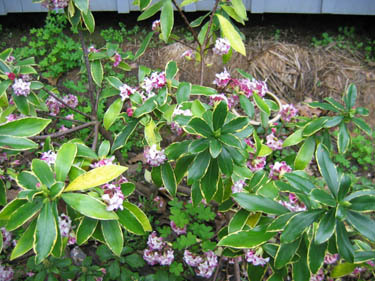 My daphne odora marginata started blooming at the end of January. I've missed the most fragrant part by being away, but I wouldn't be without it. I planted these in 1999, after I bought the house. The soil in that bed is about as bad as dirt can get and still actually grow anything. Fundamentally, it is the greasy yellow adobe. We double-dug the bed, adding lots of humus, but I am thinking that the daphne roots have probably hit the pure adobe layer. 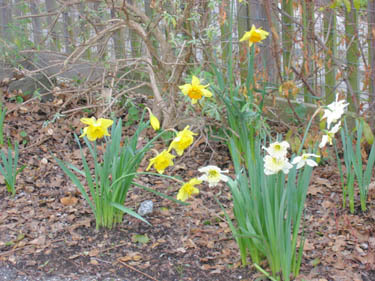 Of course, what is spring without daffodils? (Narcissus)? I planted a thousand on the bank below the house in the fall of 2002. I ended up with more of the trumpet varieties than I cared for (the ubiquitous 'King Alfred' being an example). The very double kinds don't do well for me. I prefer the tazettas, such as Poetaz; and the Jonquillas, such as 'Suzy'. 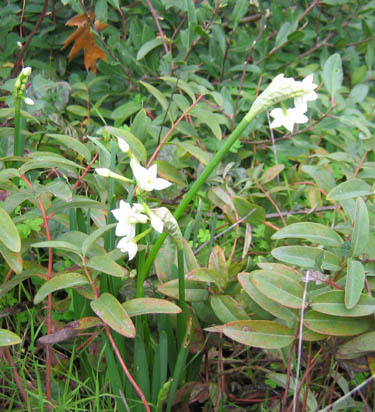 The paperwhites bloom just after the first of January. I should order some more of the tazettas and poeticus. Maybe I will in the fall. How I wish I had your ability to identify plants! I have a photo up on my site of an orange plant...don't have any idea what it is. Wanna take a stab at it?